Westridge Photos. For all your photographic processing needs. If you cannot see the moving image, please update your version of Adobe Flash. You can order services such as Photos, Canvas Prints and Gifts such as Mugs, Calendars, Photo books etc on-line for collection in store. We have a select range of cameras to suit all levels of photography. But we also show you how to use them. And help if you get stuck. Are you looking for your favourite image as a showpiece? We offer standard and custom sizes and all UV Protected. We have a large range of gifting products that you can add your images and special touches to. From mugs to laptop bags. We have been processing negatives and slides since 1990 and digital images since 1996. We know what we are doing. 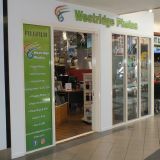 At Westridge Photos we have been processing your photographic needs since 1990. Whilst everyone is ultimately in business to make a profit, we overlook profits for passion and ensure you, the customer, are happy with your results. We take pride in showing our images in our lab and we encourage you to do the same at home or at work, or where ever seeing your images gives you the most joy. Any websites directed to by these pages are at the users risk. This website or Westridge Photos do not endorse any link found on these pages. Images shown on these pages are for illustration purposes only. Product data may come from manufacturers website.